My husband and I were heading to Nepal recently for a three week trek and thought of taking some small gifts to give to the local kids along the way. After reading about the disadvantages of doing that, I searched the net for an alternative and came across Pack for a Purpose where I could take what the actual schools needed and a better way for the kids to receive the gifts. So I packed my hand luggage (about 6 kilos) full of school supplies (pencils, erasers, sharpeners, rulers) and met up with Mr. Shreehari Thapaliya of Trekking Team Group. 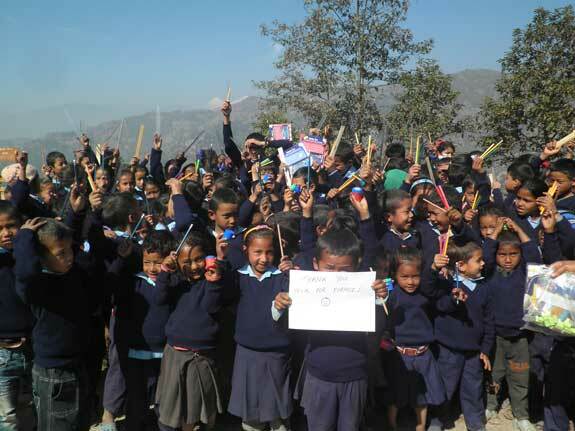 Trekking Team Group is a Pack for a Purpose participant in the Kathmandu region, and supports both a school and an orphanage. Unfortunately I was not able to go to the school myself due to lack of time, however I did leave the supplies in his capable hands for delivery. Mr.Thapaliya very kindly emailed this lovely photo of the kids to me. This is such a very rewarding way to travel and will become a part of all my future travels. It is such a small thing to do on our part but it means so much to them. Thank you Rebecca and your team for starting and maintaining this very inspirational website.